Restorer Ultimate is a program that balances between professional and DIY software. It always shows the top-level file recovery performance (the best this year). It has an exhaustive wizard interface that allows almost all file recovery parameters to be specified. It also has a powerful file previewer, S.M.A.R.T. monitoring, user-defined raw file types, and a versatile disk imaging module. While all this makes Restorer Ultimate suitable for advanced users, these complex parameters and features can confuse inexperienced users and make file recovery more difficult for them. This program can effectively handle almost all file recovery tasks and rivals many professional data recovery programs. It can be used by users with any experience level, but only advanced IT professionals can fully take advantage of all its file recovery capabilities. Other programs are more optimized for automatic recovery without any manual adjustment. Search parameters: “Show only deleted files”, “Show only existing files”, individual file search/mark for recovery, file mask (including mask presets), search/mark for recovery, file search for date (separately for modification, creation, last access), file search for size, file search for file ID. Files can be sorted by clicking column names. Support for mass file recovery: file sorting by file extension, file sorting by file timestamps. Very versatile logging. The log can be saved to a file. Image types: byte-by-byte and compressed. Parameters specified: compression rate, file split size, password, bad sector processing. The program can scan disks and save scan info while imaging. Very versatile scan parameters. Disks can be scanned partially and combined with results of several different scans. Scan results may be stored in a file during the scan and loaded later. The user can control bad sector processing and memory usage. Can be used alone on hard drives and partitions as an alternative file recovery method. Can be disabled, if necessary. User-selectable file types and support for custom file signatures, which can be added or edited using the built-in file signature editor. User file signatures can be stored in and loaded from a file. Recovers file names and the folder structure. Recovers hidden attributes, system attributes, alternative data streams for NTFS, security attributes for NTFS. Files with the same names can be overwritten/renamed/skipped according to their time stamps, file sizes, etc. Bad sector processing can be specified. Disk regions appear as objects that can be processed like regular disks. Shows hard drive’s S.M.A.R.T. attributes in a pop-up window. When attempting to work with a drive with bad S.M.A.R.T. data, the program throws a special warning that recommends performing data recover from an image. A good wizard interface suitable for inexperienced users and advanced users; almost all file recovery parameters can be specified. Languages supported: 9 languages: English, German, French, Spanish, Portuguese, Russian, traditional and simplified Chinese, and Japanese. Language management: Languages can be changed on-the-fly. File preview. Recovers files up to 128 KB. No time limit for the demo mode. The built-in previewer can show all graphic, audio, and video files. It can also show Microsoft and Open Office documents: doc, xls, ppt (Office 97-2003), docx, xlsx, pptx, ods, odt, Adobe pdf, and txt files even without having those applications installed. Picture files can be shown as medium/large tiles, and video files as icons of the first frame. After File Search: All files and folders were successfully recovered with correct original names, except 1 avi from the disk root folder. After Disk Scan: The avi file could not be successfully recovered. After File Search: Files from the disk root folder were found in their correct place. 2 jpg files had the '?' character at the beginning. The avi file was recovered successfully, but the jpg and pdf file appeared damaged. After Disk Scan: All files and folders were found in the correct places. Their names were generally correct, although many files and folders had ‘?’ as their first character. It was changed to ‘$’ during recovery. All files were recovered successfully. After File Search: All files were found in their original locations with correct file and folder names. All were successfully recovered. After File Search: 1 folder (Video) was found in its original place with correct sub-folder names, file names, and folder structure. The 3 other folders and files from the disk root folder were found in Recycle Bin with changed names. The rest of names in the Recycle Bin and folder structure were correct. All found files were successfully recovered. After File Search: 3 empty deleted folders and files from the root folder with correct names were found in the disk root folder. Another deleted folder was found with correct sub-folders and files. 3 deleted folders with changed names were found in the Recycle Bin. Those folders contained correct files with correct file names. The Recycle Bin also contained files with incorrect names from the device root folder. All files were successfully recovered, but the original file structure was not. After File search: Nothing was found. After Disk Scan: Folders $ROOT00003 and $ROOT00004 were found. They contained all folders and files with correct names, except files from the device root folder. All found files were successfully recovered. The Lost Files section contained the files from the device root folder with incorrect names. They were successfully recovered. After Deep Scan: One folder with all its content was found in its original place (the disk root folder). All files were successfully recovered. Some remnants of the previous file structure were found in $$$Lost_Folder12582913 folder with some files. All of them were recovered correctly. Many raw files were found in the Lost Files folder. Some were successfully recovered. Files that could not be recovered: 2 jpg, 4 mp3, 2 pdf, 6 doc, 4 docx, 2 xls, 2 xlsx, 1 odt, and 2 ods. After Disk Scan: The folders from the disk root folder with correct names were found in the $ROOT00003 folder on the exFAT_0000 partition. They contained all sub-folders and files with correct file names. All those files were successfully recovered. All, but one, files from the disk root were found in the Lost Files (with incorrect names) and successfully recovered. The avi file from the disk root folder could not be found or recovered. After Disk Scan: An exFAT partition was found containing all files and folders with correct file and folder names. Those files and folders were successfully recovered. After Disk Scan: All files and folders were found on the found NTFS partition and successfully recovered. Immediately found a FAT32 partition of the correct size. No scan was required. After Fast Search for lost files on the partition: All files and folders were found with correct names and successfully recovered. mmediately found an exFAT partition of the correct size. No scan was required. After File Search: All files and folders were found with correct names and successfully recovered. After Disk Scan: The damaged partition was found with all folders and files with correct names. All of them were successfully recovered. Immediately found an exFAT partition of the correct size. No scan was required. After Disk Scan: The exFAT_0000 partition was found with all folders and files with correct names. All of them were successfully recovered. After Disk Scan: The deleted partition was found with all folders and files with correct names. All of them were successfully recovered. After Disk Scan: A FAT32_0000 partition was found. It contained all folders and files with correct names. All of them were successfully recovered. Restorer Ultimate is a program that balances between professional and DIY software. It always shows the top-level file recovery performance. It has a complicated wizard interface that allows almost all file recovery parameters to be specified. It also has a powerful file previewer, S.M.A.R.T. monitoring, user-defined raw file types, and a versatile disk imaging module. While all this makes Restorer Ultimate suitable for advanced users, these complex parameters and features can confuse inexperienced users and make file recovery more difficult for them. This program can effectively handle almost all file recovery tasks and rivals many professional data recovery programs. It can be used by users with any experience level, but only advanced IT professionals can fully utilize all its file recovery capabilities. Other programs are more optimized for automatic recovery without manual interference from inexperienced users. Languages supported: English, German, French, Spanish, Portuguese, Russian, traditional and simplified Chinese, and Japanese. Language management: Languages can be changed on-the-fly. The built-in previewer can show all graphic, audio, and video files. It can also show Microsoft and Open Office documents: doc, xls, ppt (Office 97-2003), docx, xlsx, pptx, ods, odt, Adobe pdf, and txt files even without having those applications installed. Almost all files were found in their original locations with correct file and folder names. Some files and folders had the ? character instead of their first letters. Almost all files were correctly recovered. Exceptions are: 1 xls, 4 png, and 1 avi. 1 xls, 4 png, and 1 avi were found and correctly recovered. All files were found in their original locations with correct file and folder names. All were correctly recovered. All files and folders were correctly recovered with correct original names, except 1 avi from the disk root folder. The avi file could not be correctly recovered. 3 empty deleted folders with correct names were found in the disk root. Another deleted folder was found with correct sub-folders and files. The disk root contained the files from the root folder with correct filenames. 3 deleted folders with changed names were found in the Recycle Bin. Those folders contained correct files with correct file names. The Recycle Bin also contained files with incorrect names from the device root. All files were correctly recovered, but the original file structure was not. 1 folder (Video) was found in its original place with correct sub-folder names, file names, and folder structure. The 3 other folders and files from the disk root were found in Recycle Bin with changes names. The rest of names in the Recycle Bin and folder structure were correct. All found files were correctly recovered. Files and folders were found in the Lost Files section. The folder structure was partially recovered. Most files were recovered from raw files without their original file names. 7 files were not recovered: 1 jpg, 2 odt, 2 xlsx, 2 ods. Folders $ROOT00003 and $ROOT00004 were found. They contained all folders and files with correct names, except files from the device root folder. All found files were correctly recovered. The Lost Files section contained the files from the device root folder with incorrect names. They were correctly recovered. The folders from the disk root folder were found with names like $ROOT00025. They contained all sub-folders and files with correct file names. All those files were correctly recovered. Most files from the disk root were found in the Lost Files and successfully recovered. 1 avi file from the disk root could not be found and recovered. An exFAT partition was found containing all files and folders with correct file and folder names. Those files and folders were correctly recovered. All files and folders were found and correctly recovered, except 2 xlsx and 1 mp3. The damaged partition was found with all folders and files with correct names. All of them were correctly recovered. The exFAT partition was found with all folders and files with correct names. All of them were correctly recovered. The deleted partition was found with all folders and files with correct names. All of them were correctly recovered. The exFAT_0000 partition was found with all folders and files with correct names. All of them were correctly recovered. A FAT32_0000 partition was found. It contained all folders and files with correct names. All of them were correctly recovered. 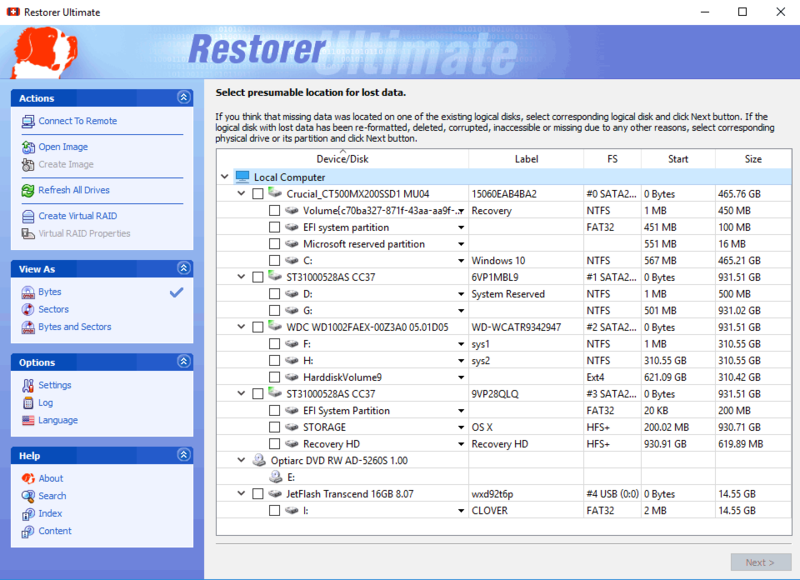 Restorer Ultimate has a complicated wizard interface that allows almost all file recovery parameters to be specified. While this makes Restorer Ultimate suitable for advanced users, these complex parameters can confuse inexperienced users and make file recovery more difficult for them. It also showed the best file recovery results, especially while recovering reformatted, damaged, and deleted partitions. This program can effectively handle almost all file recovery tasks and rivals many professional data recovery programs. It can be used by users with any experience level, but only advanced IT professionals can fully utilize all its file recovery capabilities. Other programs are more optimized for automatic recovery without manual interference from inexperienced users. Recovers file names and the folder structure. Recovers hidden attributes, system attributes, alternative data streams for NTFS, security attributes for NTFS. Raw files (files found using file signatures) can be enabled or disable during the data recovery. Files with the same names can be renamed during recovery. Bad sector processing can be specified. Search parameters: “Show only deleted files”, “Show only existing files”, individual file search/mark for recovery, file mask search/mark for recovery, file search for date (separately for modification, creation, last access)*, file search for size, file search for file ID. Support for mass file recovery: file sorting by file extension, file sorting by file timestamps. Very versatile scan parameters. Search only for specified file systems during the scan. Disks can be scanned partially and combined with results of several different scans. Scan results may be stored in a file during the scan and loaded later. The user can control bad sector processing and memory usage. A complicated wizard interface suitable for advanced users; almost all file recovery parameters can be specific. However, these complex parameters can confuse inexperienced users and make file recovery for them more difficult. Languages supported English, German, French, Spanish, Portuguese, Russian, traditional and simplified Chinese, and Japanese. Language management Languages can be changed on-the-fly. Localized file name recognition Recognized all tested localized characters in file and folder names. Recovers files up to 128 KB. No time limit for the demo mode. The built-in previewer can show all graphic, audio, and video files. It can also show Microsoft Office documents: doc, xls, ppt (Office 97-2003), docx, xlsx, pptx and Adobe pdf even without having those applications installed. After file search: Almost all files were found in their original locations with correct file and folder names. Some files and folders had the ? character instead of their first letters. Almost all were correctly recovered. Exceptions are: 1 xls, 4 png, 3 mts, and 1 avi. After disk scan: 1 xls, 4 png, and 1 avi were found and correctly recovered. After fast search for lost files: All files, except 1 pdf from the disk root were found in their original locations with correct file and folder names. All were correctly recovered except 2 xlsx and 4 mp3 files. After disk scan: The pdf file was found with the correct name in the Lost Files and correctly recovered. The 2 xlsx and 4 mp3 files could not be recovered using a disk scan either. After file search: Almost all files and folders were correctly recovered with correct original names. Only 1 avi file from the disk root was recovered incorrectly. After disk scan: The 1 avi file could not be recovered even after disk scan. After fast search: 1 folder (Video) was found in its original place with correct sub-folder names, file names, and folder structure. The 3 other folders and files from the disk root were found in Recycle Bin with changes names. The rest of names in the Recycle Bin and folder structure were correct. 2 xlsx files in the Recycle Bin were damaged. 1 avi file wasn’t found. All found files were correctly recovered. After disk scan: The missing avi file and damaged xlsx files from the fast search results were found in the Extra Found Files. The xlsx files had the correct file names, the avi one had an incorrect one. The files were correctly recovered. After fast search for lost files: 3 empty deleted folders with correct names were found in the disk root and in another deleted folder with correct sub-folders. 3 deleted folders with changed names were found in the Recycle Bin. Those folders contained correct files with correct file names. The Recycle Bin also contained files with incorrect names from the device root. All files were correctly recovered, but the original file structure was not. After disk scan: The folders from the disk root were found with names like $ROOT00011. They contained all sub-folders and files with correct file names. All those files were correctly recovered. Most files from the disk root were found in the Extra Found Files and successfully recovered. 1 avi file from the disk root could not be found and recovered. After disk scan: All files and folders were found and correctly recovered, except 2 xlsx and 1 mp3. After disk scan: Files and folders were found in the Lost Files section. The folder structure was partially recovered. Most files were recovered from raw files without their file names. 35 files were not recovered: 2 odt, 2 xlsx, 2 ods, 29 mp3. After disk scan: An exFAT partition was found containing all files and folders with correct file and folder names. Those files and folders were correctly recovered. After file search for lost files: Nothing was found. After disk scan: Folder $ROOT00001 was found containing all folders and files with correct names. All of them were correctly recovered. After disk scan: The damaged partition was found with all folders and files with correct names. All of them were correctly recovered. Immediately found a FAT32 partition of the correct size. No scan was required. After fast search for lost files on the partition: All files and folders were found with correct names and correctly recovered. Immediately found an exFAT partition of the correct size. No scan was required. After file search: All files and folders were found with correct names and correctly recovered. After file search: All files and folders were found with correct names and correctly recovered. After disk scan: exFAT_0000 partition was found with all folders and files with correct names. All of them were correctly recovered. After Disk scan: The exFAT partition was found with all folders and files with correct names. All of them were correctly recovered. After disk scan: FAT32, exFAT, and NTFS partitions were found. The FAT32 partition contained all folders and files with correct names. All of them were correctly recovered. After disk scan: The deleted partition was found with all folders and files with correct names. All of them were correctly recovered. This DIY file recovery program took back first place since our last review. It has the best user interface, an excellent set of file recovery features and now the best ratings for file recovery performance. It is capable of solving almost all file recovery tasks, rivaling many professional data recovery programs. Its excellent file previewer partially makes up for its relatively restrictive demo mode limitations. Recommended for both advanced and inexperienced computer users. 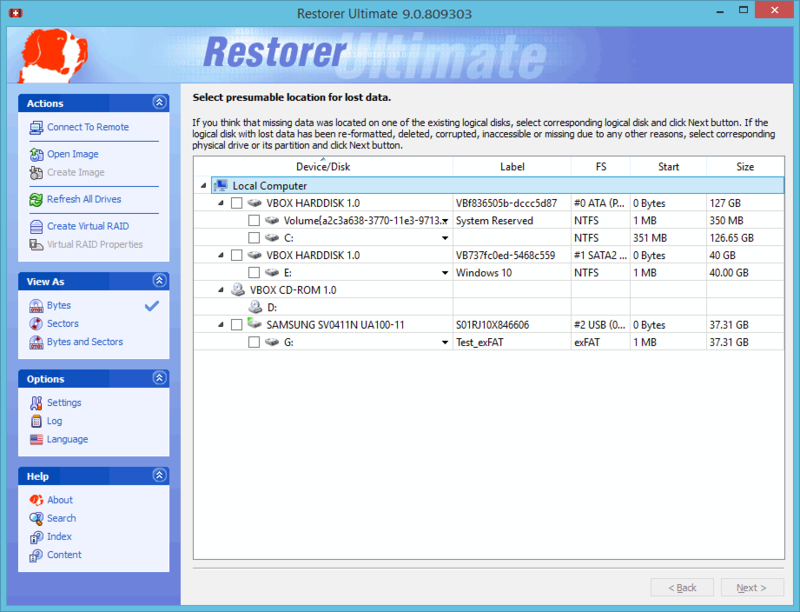 Restorer Ultimate can be upgraded to the PRO version with support for more file systems, RAIDs, etc. We consider the PRO version an ideal data recovery solution for advanced computer users and IT professionals without much experience in data recovery. And last but not the least, this is the lowest-priced program in the list. Even the PRO version is affordable enough to be included in our DIY file recovery software review. Search parameters: “Show only deleted files”, “Show only existing files”, individual file search/mark for recovery, file mask search/mark for recovery, file search for date, file search for size, file search for file ID. Support for mass file recovery: file sorting by file extension, file sorting by file timestamps. Image types: byte-by-byte and compressed. Parameters specified: compression rate, file split size, password, bad sector processing. The program can scan disks while imaging. Shows hard drive’s S.M.A.R.T. attributes in a pop-up window. When attempting to work with a drive with bad S.M.A.R.T. data, the program throws a special warning that recommends performing data recovery from an image. FAT/exFAT, NTFS/NTFS5, ReFS Can be upgraded to the PRO version, which supports HFS/HFS+, Ext2/3/4fs, and UFS file systems. Recovers file names and the folder structure. Recovers hidden attributes, system attributes, alternative data streams for NTFS, security attributes for NTFS. Raw files (files found using file signatures) can be included to / excluded from, the data recovery. Files with the same names can be renamed during recovery. Bad sector processing can be specified. Best wizard interface among all tested programs. Logically straightforward and comprehensible for even an inexperienced user. At the same time, it allows advanced users to specify almost all file recovery parameters. Languages supported: English, German, French, Spanish, Portuguese, Russian, traditional and simplified Chinese, and Japanese. Language management: Languages can be changed on-the-fly. Localized file name recognition: Recognized all tested localized characters in file and folder names. After File search on the partition: File and folder structure: All files and folders were found with correct names, except the first character of all folder names (except the mp3/video folder) and all jpg files was replaced with ? . Successfully recovered: All files. After Deep disk scan: Successfully recovered: correct file and folder names were not found. After File search on the partition: Almost all files and folders were correctly recovered with correct original names. Not recovered (files damaged): 1 mp4 file in the root folder. **After Deep disk scan: ** The unrecovered file wasn’t found, even among Raw files. File and folder structure: All file names in the subfolders were correctly recovered. Subfolder names and file names in the root folder (2 mp4 files) were not recovered. Successfully recovered: 2 mp4 files (marked as hidden), 6 doc and 5 docx files, 6 mp3 files, 6 video files, 6 pdf files, first 53 jpg files. Not recovered (files damaged): All xls and xlsx files, one docx file, the last 47 jpg files. After disk scan: None of the unrecovered files were found, even among the raw files. After File search on the partition: All files and folders were correctly recovered with correct original names. No files were found in the Recycle Bin. After File search on the partition: Almost all files and folders were correctly recovered with correct original names. Not recovered (files damaged): the pseudo-random file and one docx file. After Deep disk scan: The unrecovered file wasn’t found, even among Raw files. After File search on the partition: File and folder structure: No files or folders were found. After Scan: The previous exFAT partition (with the size of 8GB) was found. File and folder structure: All files and folders were found in correct place with correct names. Successfully recovered: All files were correctly recovered. After Scan: File and folder structure: All files and folders were found in the $ROOT00001 folder with correct names. All files and folders were marked as deleted. Successfully recovered: All files were correctly recovered. After Fast search for lost files on the partition: File and folder structure: No files or folders were found. After Deep Scan: Recovered as raw files (without file names): all pdf, all doc, all docx files, all xls and xlsx files, ods, odt, all jpg files, flv, mpeg, avi files, and all mp3 files (with their file names), 3 mp4. Partially recovered as raw files (without file names): 6 mp4 files with an incorrect extension 3gp, 2 mov files with an incorrect extension mp4, one m4v with an incorrect extension mp4. Not recovered (files damaged): 2 mts, 1 mp4 from the root folder files, and the pseudo-random file. After Deep disk scan: Recovered as raw files (without file names): all 6 pdf files, 5 docx files, all 6 doc files, ods and odt files, all xls, all jpg files, 1 flv, 3 mp4, and 1 avi files, all mp3 files (with their file names). Partially recovered as raw files (without file names): mpeg file (5 times larger, but playable), 6 mp4 with an incorrect extension 3gp, 2 mov files with an incorrect extension mp4, 1 m4v file with an incorrect extension mp4. Not recovered (files damaged): 2 mts, 1 mp4, 1 docx, all xlsx files, and the pseudo-random files. After Scan: The previous NTFS partition was found. File and folder structure: All files and folders were found in correct place with correct names. Successfully recovered: All files were correctly recovered, except: Not recovered (files damaged): 1 docx file and 1 mp4 file from the subfolder. Recovered as raw files (without file names): No unrecovered files were found. After File search on the partition: Immediately found an exFAT partition of the correct size. File and folder structure: No files or folders were found. After Deep disk scan: File and folder structure: All files and folders were found with correct names. Successfully recovered: All files were correctly recovered. After Deep disk scan: File and folder structure: All files and folders were found in the previous NTFS partition with correct names. Successfully recovered: All files were correctly recovered. After Deep disk scan: The previous exFAT partition (with the size of 8GB) was found. File and folder structure: All files and folders were found with correct names. Successfully recovered: All files were correctly recovered. After Deep disk scan: File and folder structure: All files and folders were found in the previous FAT32 partition with correct names. Successfully recovered: All files were correctly recovered. Previously the top-rated DIY file recovery software, this program still boasts the best user interface, an excellent set of file recover features and one of the best ratings for file recovery performance. It is capable of solving almost all file recovery tasks, rivaling many professional data recovery programs. This year, it losses stars for its unchanged demo version restrictions now seem too prohibitive compared with other evaluated programs. The file size limit of 128 KB is not enough to reliably estimate chances for successful file recovery. Its excellent file previewer partially makes up for that drawback. Recommended for both advanced and inexperienced computer users. 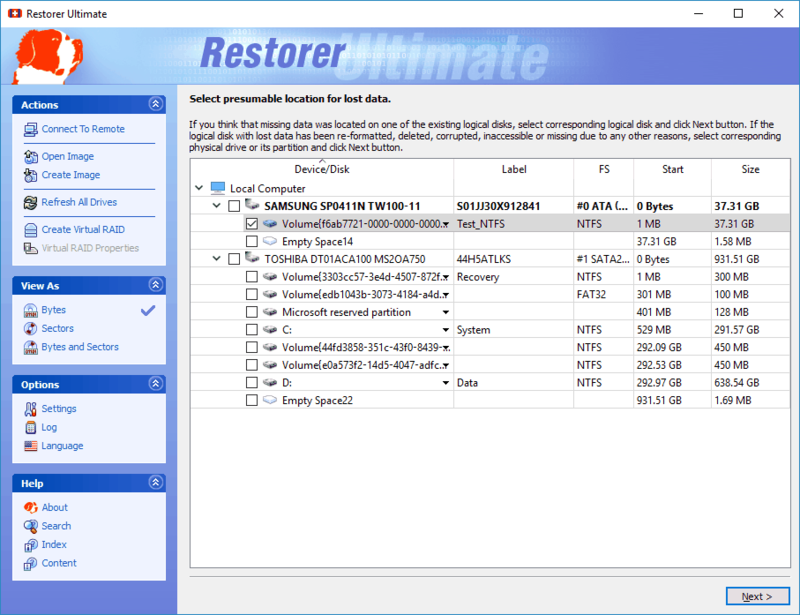 Restorer Ultimate can be upgraded to the PRO version with support for more file systems, RAIDs, etc. We consider the PRO version an ideal data recovery solution for advanced computer users and IT professionals without much experience in data recovery. And last but not the least, this is the lowest-priced program in the list. Even the PRO version is affordable enough to be included in our DIY file recovery software review. Recovers file names and the folder structure. Recovers hidden attributes, system attributes, alternative data streams for NTFS, security attributes for NTFS. Extra Found Files (files found using file signatures) can be included to / excluded from, the data recovery. Files with the same names can be renamed during recovery. Bad sector processing can be specified. Can be used alone on hard drives and partitions as an alternative file recovery method. Can be disabled, if necessary. The user can specify which file type to search for. The program also supports custom file signatures, which can be added or edited using the built-in file signature editor. User file signatures can be stored in and loaded from a file. Recently deleted files: The program successfully recovered all files with their original names. Previously deleted files: The program could find and recover many (not all) files with their original filenames. Many recovered files appeared damaged. Recently deleted files: The program successfully recovered all test files and the deleted folder, but their filenames were changed. Previously deleted files: The program could find and successfully recover many (not all) files, mostly using raw file search. Successfully recovered all files. Did not original folder name (used a dummy folder). All files were found and successfully recovered with their original file and folder names. The program successfully recovered all files but one (a jpg) with their original file names. Did not recover original folder name (used a dummy folder name). Successfully recovered all files and the folder with its original name. Successfully recovered all files and the original folder. The file system was immediately recognized without disk scan. All files were found and successfully recovered with the original folder. The programs successfully recovered all files with their original folder. A very good combination of file recovery features and performance. It’s capable of solving almost all file recovery tasks and it rivals many professional data recovery programs in its features. Recommended for both advanced and inexperienced computer users. In addition, Restorer Ultimate can be upgraded to the Pro version with support for more file systems, RAIDs, etc. We consider the Pro version an ideal data recovery solution for advanced computer users and IT professionals without much experience in data recovery. And last but not the least, this is the lowest-priced program in the list. Software features that help users find, sort, and mark files for recovery: “Show only deleted files”, “Show only existing files”, individual file search/mark for recovery, file mask search/mark for recovery, file search for date, file search for size, file search for file ID, file sorting by file extension, file sorting by file timestamp. Users can add and edit their own file signatures. A built-in file signature editor allows creation of very complex signature combinations. Recovers file names and folder structure. Recovers hidden attributes, system attributes, alternative data streams for NTFS, security attributes for NTFS. Full logging, with parameter adjustment. Regions appear as objects that can be processed like regular disks. A very versatile scan parameter set. Disks can be scanned partially, with combined results of several different scans. Scan results may be stored in a file during the scan and loaded later. Pro: All of the above, plus HFS/HFS+, Ext2/3/4fs, and UFS file systems. The best wizard interface among all tested programs. Logically straightforward and comprehensible, even for an inexperienced user. At the same time, it allows the more advanced user to tweak the parameters for more powerful file recovery—almost matches pro software in terms of advanced features. Supported interface languages: English, German, French, Spanish, Russian. Includes file preview. Recovers files up to 128 KB in size. No time limit for the demo version. The built-in previewer can show all graphic, audio, and video files. It can also show Microsoft Office documents: doc, xls, ppt (Office 97-2003), docx, xlsx, pptx and Adobe Acrobat pdf even without having those application installed. Recently deleted files: Recovered all files. Previously deleted files: Could find many (not all) files with their original filenames. Many recovered files appeared damaged. Recently deleted files: Successfully recovered all test files and the deleted folder. Previously deleted files: Could find many (not all) files, mostly using raw file search. Found and successfully recovered the following files in the Lost Files folder (the folder where the raw files reside): pdf, zip, jpg (2 files), xls. Files split in several parts: mp3 and txt. Wrong file size: avi (greatly increased), still playable. Found in the Lost Files folder and successfully recovered: pdf, zip, jpg (2 files), xls, doc. Wrong file size: avi (increased by 2 MB), still playable. Successfully recovered all files with their original file names and the original folder name. Successfully recovered all files with their original file names. Could not recover the original folder name. Found the deleted NTFS partition, although with incorrect size. All files were found and correctly recovered with their original file and folder name. Successfully recovered all files but one (a jpg) with their original file names. Didn’t recover the original folder name (used a dummy one). Found in the Lost Files folder and successfully recovered: pdf, jpg (2 files), xls, doc, zip. All programs could successfully recover all files and the original folder. All programs successfully recovered all files with their original folder.